It's been nice to have been back in a bit of a workout routine of late. Until today, when I had a mild asthma-meets-low-blood-sugar episode at the end of my trainer session (dizziness is not cool, body, step it up! ), I have been feeling stronger and stronger as I have been adding in new routines to my workouts. The scale hasn't budged as much, but I know I am adding muscle, dropping some fat, and things will even out soon enough. I haven't been in the gym more, per se, but have been trying to make the most of the time I am in there. On Saturday, for example, I visited the brand new LA Fitness in Buckhead (omg gorg by the way! ), and ran a mile on the treadmill before hitting spin class for an hour. Double duty? Kind of. But I have to show up early to reserve a bike, anyways, so I might as well get in a little jog. I only wish that I had the time (and energy) to do that kind of workout every day! This coming weekend, I am making the most of the day by participating in a cool race right here in town. The 9th Annual Junior League of Atlanta’s Shamrock ‘N Roll Road Race presented by Verizon Wireless and Belk is being held on Sunday, March 10, 2013. 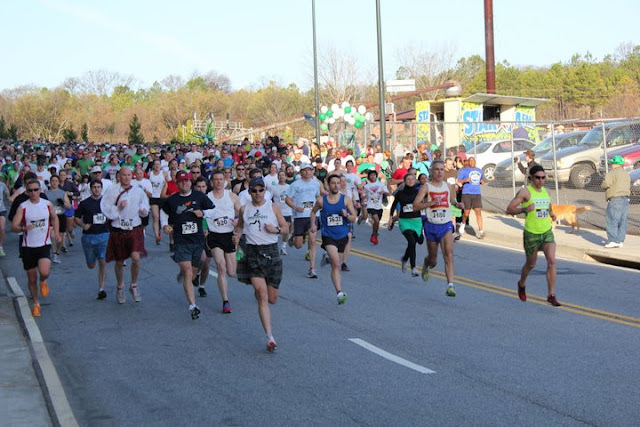 The Shamrock ‘N Roll features a family friendly 5k, 10k and the Leprechaun Dash for Gold Tot-Trot for little runners ages five and under (cute!!). Are you running the Shamrock too this year? It's not too late to sign up. Here are some details, if you are interested in the race. Hosted by The Junior League of Atlanta (JLA), this ninth annual event raises funds to train and educate the membership of JLA for effective community service, as well as to continue its work in the community. Registration is $30 in advance, $35 at packet pickup and $45 on race day. Tot Trot registration is $8. Register today at Active.com or www.shamrocknroll.org. Pick up your packet and finish late registration at West Stride Running Store, 3517 Northside Parkway #11, Atlanta, GA 30327, (www.weststride.com) Friday, March 8 12-7PM. or Saturday, March 9 10-5PM. Packets can also be picked up race morning at the registration desk. Stay up-to-date on all the Shamrock ‘N Roll Road Race news and updates as a fan on http://www.facebook.com//ShamRockNRollRoadRace or by following @JLShamRockNRoll on Twitter. Disclaimer: The JLA has provided me with registration for the race, but all opinions are my own. Happy racing, everyone!